The start of the week, post sale, feels quite freeing…my mind wanders around the ‘what do I want to be now’ territory that I always enjoy at the end of a project. The feeling is compounded with the final meeting, the final report tweaking and a lovely celebratory dinner with the twentyONE+ team. This project, that has stretched us all, is as good as done – the only downside being that I will miss catching up regularly with this team that gelled so nicely. I cannot start another project in the foreseeable future, I need to self nurture and to be available for my family, but the problem solving and the friendship that comes with teamwork will be sorely missed. What do I want to spend my time on? And how can I continue to stretch myself and to learn? 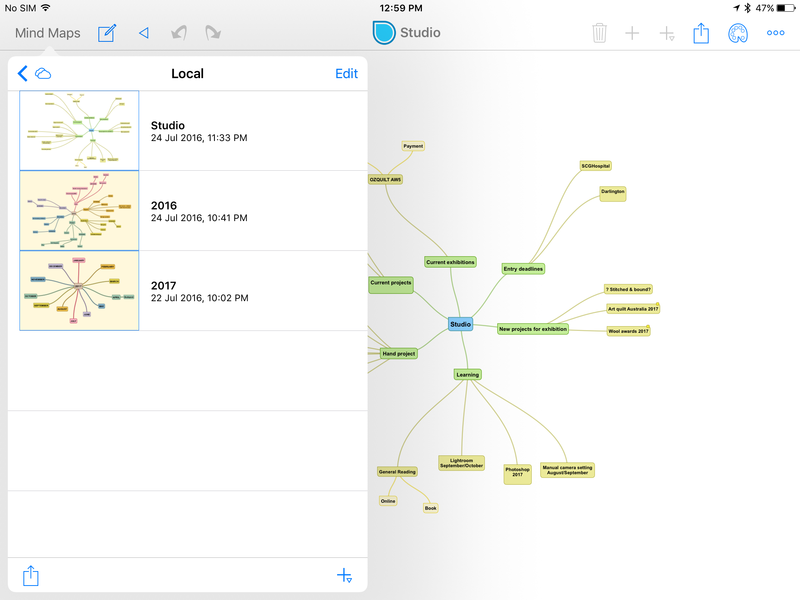 To help make sense of the near and far future I did commit to a mind map app. I have needed yet another layer of organisation to clear my head and help me to sleep better at night. I did try to find a ‘big picture type app’ to suit me earlier in the year. With no success so I turned old school and printed out the year and stuck it on a board. It was not what I wanted but it did serve to scare me as I crossed off the weeks and tore off the months! A upstairs board cannot be with me anywhere else but upstairs and I needed an app to access whenever my constantly flitting thoughts needed recording or tweaking. My recent clear out and freshen up of the studio necessitated a fresh look at this need. What I wanted was now refined as I already work well through ToDoist for daily/weekly/longterm tasks and I use Day One to record what I do plan and do daily. Both help me feel like those small tasks do make a whole. I still needed SEE the big picture view. I needed it to be visual/diagramatic and it needed to work on my ipad only this time. My use will be irregular – as it is a long term planning need – so I did not want a hefty system with a hefty price. I settled on SimpleMind for my ipad as it is very simple and intuitive. So far I have made three maps, Studio, 2016 & 2017. There was again a tiny touch of stitch….I worked on quilting the three silk cushion fronts between tasks. 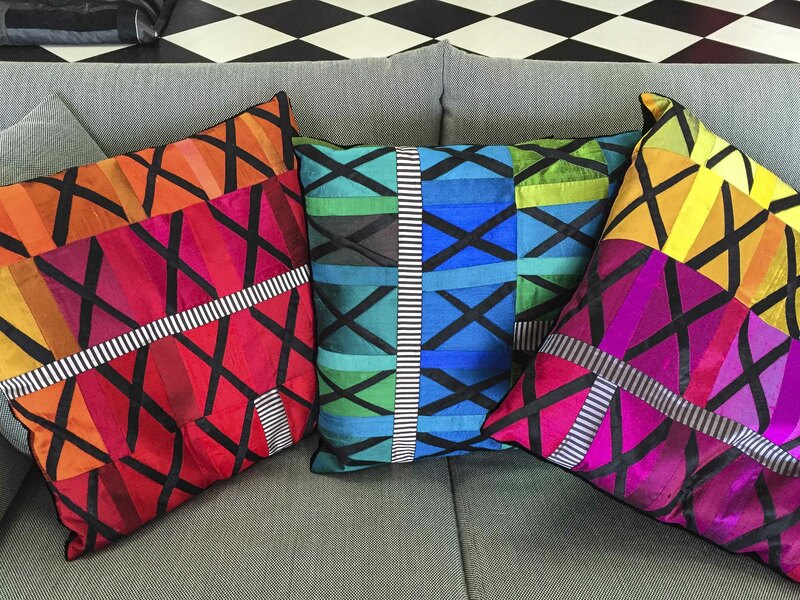 The velour backings from the previous cushions were unpicked – an unpleasant job – and slowly I completed all three by working to my deadline. I loved the original versions but surprisingly these are better…. I am so glad that these offcuts needed to stay with me. My foray into getting some classes going has faltered..this morn I cancelled the first one as there were not enough bods to run it. Sad but realistic. I have put up extra dates, on the menu above and will send them out to my database soon. This will see out the year but again, I will not advertise them widely. I can get by without teaching but I yearn to empower, educate and excite others. Salvage/Selvedge was a forum for what I love doing best….perhaps I cooked my own goose in teaching for free for eighteen months? Alas I cannot afford to do a project like that again. Two eighteen-month projects, working gratis, the first with many studio & hosting costs, has not empowered my bank balance…. 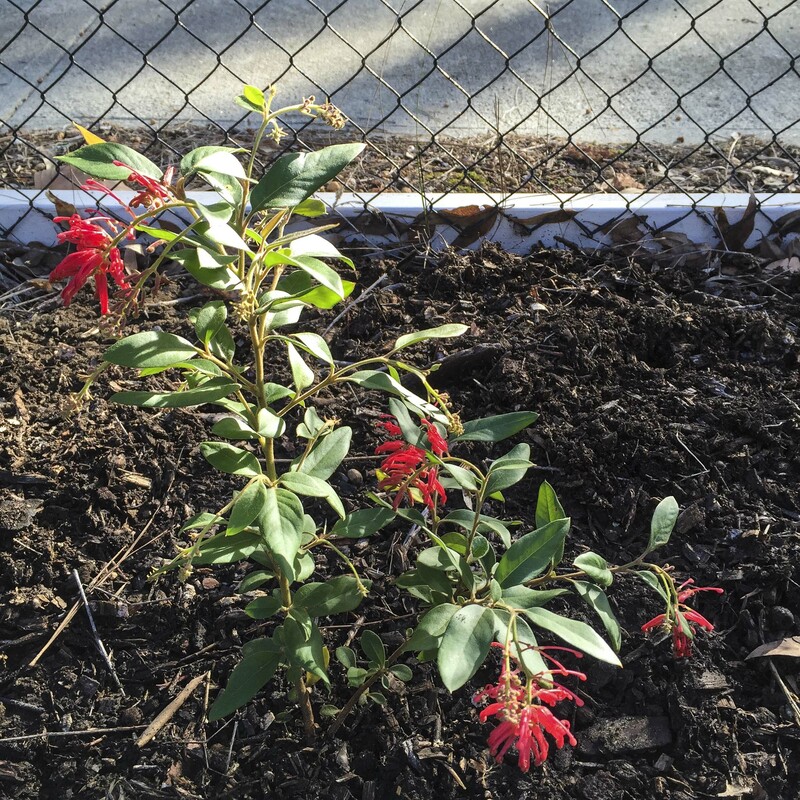 This task is shoved to next week’s thought pile – hopefully with a more successful outcome as I am itching to get a long term SLOW project underway. Down south and we decide to use the wet winter morn to head to Pinjarra for plants to fill an empty section of front fence. We tried blueberries early on but despite all the advice and care given they failed. 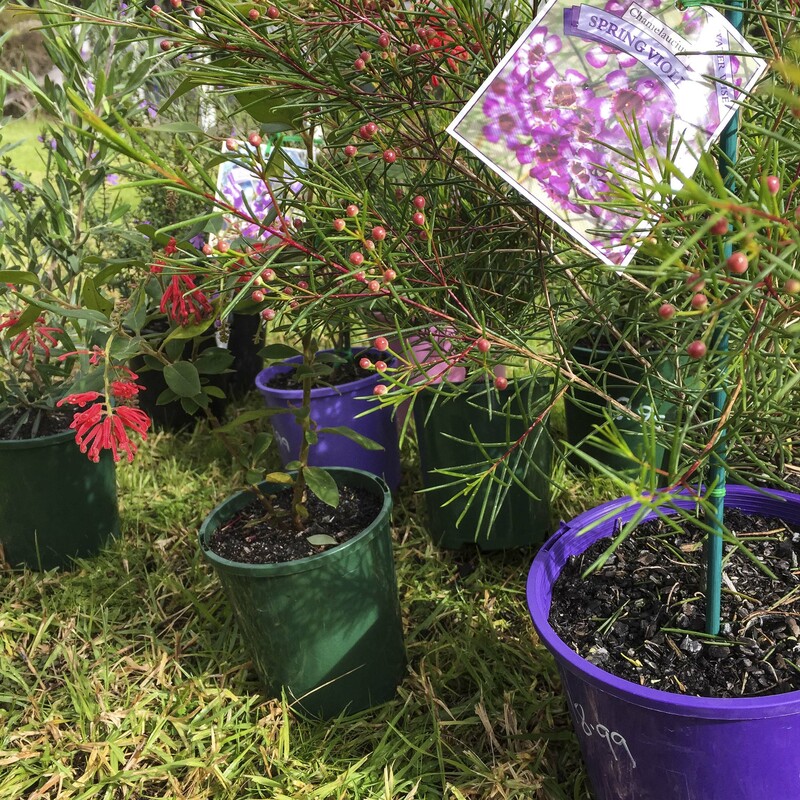 Natives to form a bird-attracting hedge was the current thought so we have Westringas, Waxes and Grevilleas. Fingers crossed. 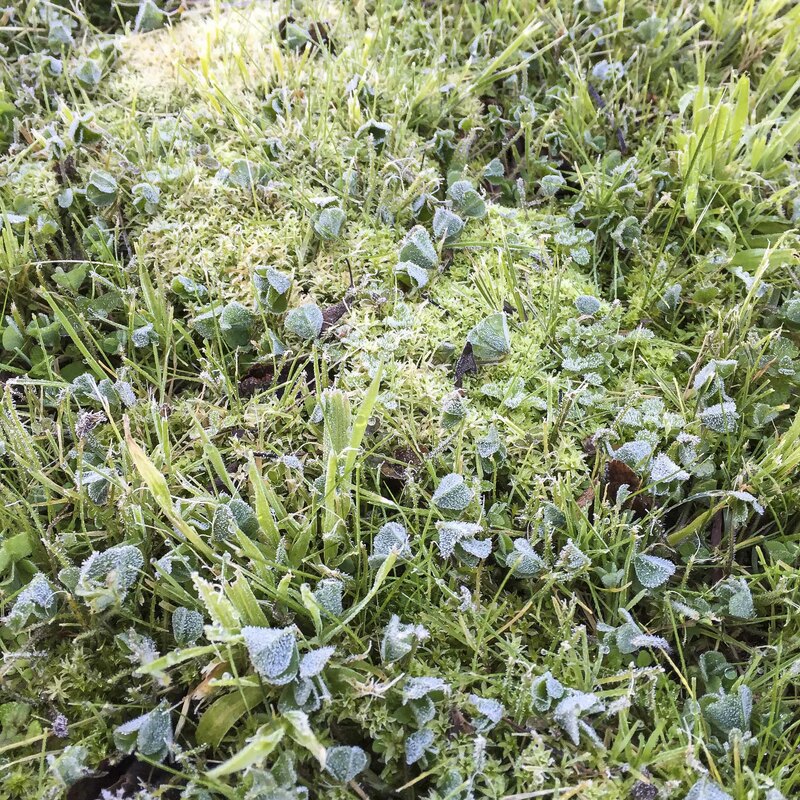 They did survive the first night in our FROSTY garden so here’s hoping. So cold down here on Sunday morn. 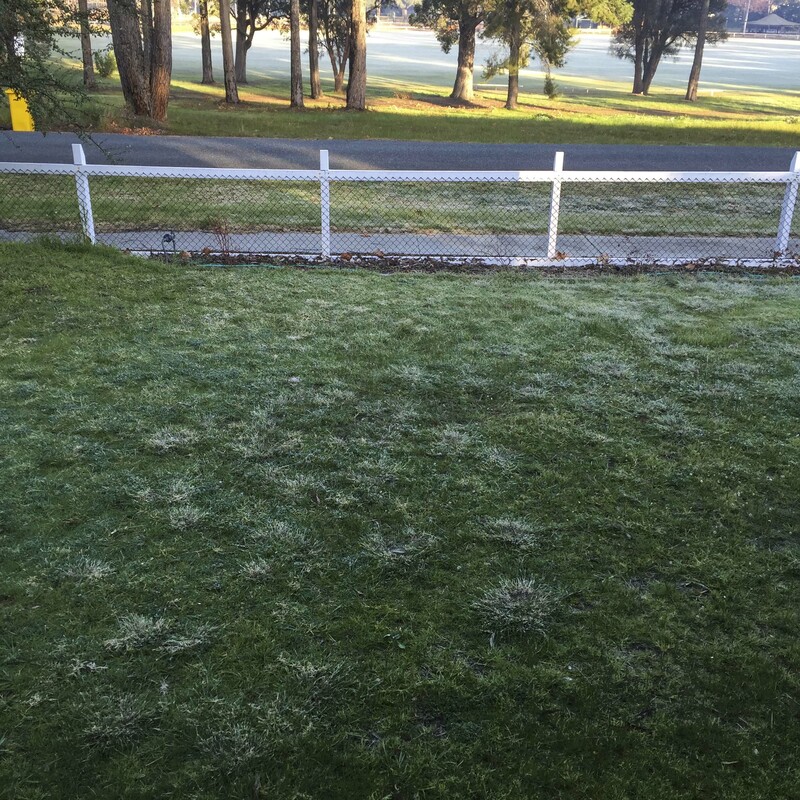 Minus one degree and frost on the oval – which is not abnormal – but we also had a frosty lawn and both were still white and crunchy at 8am which is something we newbies have not seen before. 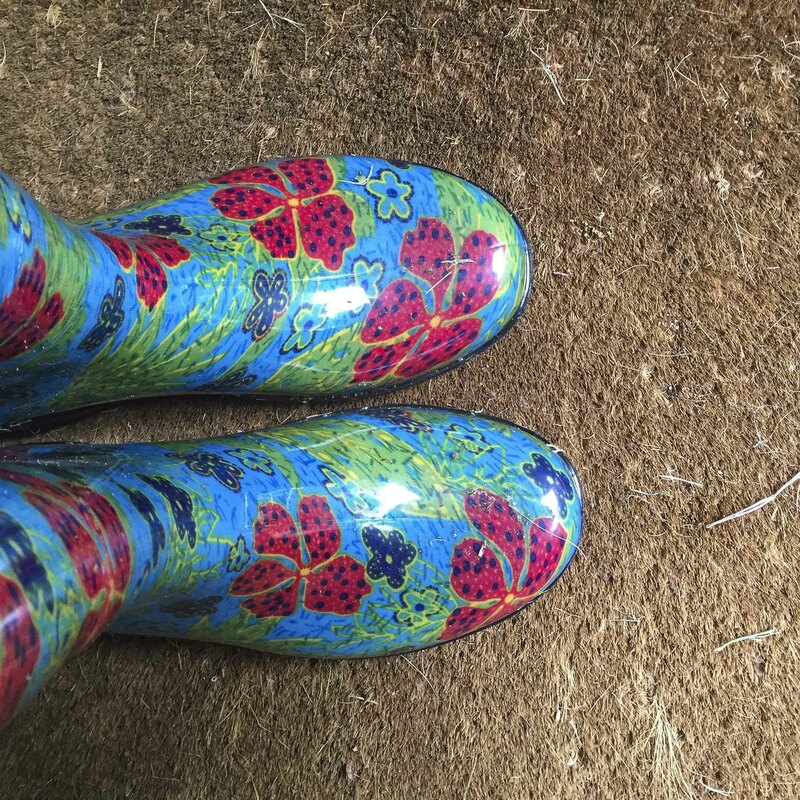 I love seeing the seasons up close….and my new very comfy, not black SO not my taste at all gumboots kept my tootsies suprisingly warm and happy.